Many private homeowners want to have their own swimming pool or home wellness area that can compare in terms of feel-good factor and equipment with a professional atmosphere. In upmarket sports and fitness centres as well, more emphasis is placed these days on relaxation options, for instance in an additional wellness area or swimming pool. Here, however, attention is largely focused on the design, although air conditioning and humidity control also have a major influence on well-being and building structure. For the operator, neglecting the air conditioning of swimming pools and wellness areas, in particular their dehumidification, can have serious consequences. If not sufficiently taken into account during planning and implementation, a hot and humid greenhouse climate can develop in an indoor swimming pool, causing circulation problems for people and damage to the facilities or building. If mould growth develops on cooler surfaces due to the extreme humidity, human health can suffer due to mould spores. In the worst case scenario, the operator incurs high remediation costs or is even forced to shut down the pool completely. Similar problems also frequently occur in fitness centres, especially in changing rooms. It is therefore advisable, already in the preliminary planning phase, to consult an expert who will professionally design a suitable dehumidification system so that too much humidity does not affect bathing fun and relaxation. Different manufacturers offer suitable solutions for every need and comfort requirement. In the following, an overview will be given of the design limits to be complied with and of the dehumidification systems developed primarily for the private, hotel and sport pool sectors. The VDI Guideline 2089 Sheet 1  provides a good basis for the planning of air conditioning for private indoor swimming pools, even though it’s not mandatory that it’s applied to them. This guideline, which was drawn up primarily for the air conditioning of professional and public swimming pools, also provides valuable information for the private sector regarding the parameters for air and water as well as the corresponding calculation procedures. Based on the VDI Guideline 2089 Sheet 1, the guideline 02/2009 “Minimum Requirements for Ventilation Systems”  was developed. 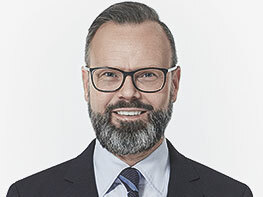 It was published by the German Swimming Pool & Wellness Association and forms a very practice- oriented basis for calculation in the private pool sector. For the above-mentioned reasons, such as the comfort of users, the cost-effectiveness of the operation and the protection and preservation of building structures, it is strongly recommended to comply with one of these guidelines. The formulas, tables and diagrams contained in these guidelines make it easy to determine the amount of evaporating water and the required performance of the dehumidifier as a result. One is guided here by the usual set values for pool water temperature of 28°C to a maximum of 32°C and an air temperature of 30°C to 34°C. To avoid excessive water evaporation, the air temperature during system operation should be 2 to 3 K above the pool water temperature. For energy-related reasons, however, a maximum air temperature of 34°C is recommended. Even if a swimming pool water temperature is selected lower than the one provided for in the guidelines, the 2 to 3 K higher indoor temperature should be maintained, not only to limit evaporation, but also to ensure the comfort of users. Indoor air humidity has a very big impact on well-being. For air that is too humid and hot creates a tropical climate that produces an unpleasant feeling of sultriness in humans. To avoid this, according to VDI 2089 the water content of x = 14.3 g water per kg of air, which is the physiological humidity limit for a person without any clothes on, should not be exceeded. • Is there a pool cover when not in use? With these details, an appropriate dehumidifier can now be designed. However, it is advisable in some cases, for instance during remediation, to visit the project. A regrettably still common method for lowering the air humidity in indoor swimming pools is largely uncontrolled ventilation by means of external and outgoing air. In this process, very hot and humid pool air is conducted outside with a fan and drier air from outside is brought into the pool. If no heat recovery system is available, however, this air must be heated, using a lot of energy. This approach is basically a pure waste of energy, especially considering today’s energy costs, and entails unnecessary financial burdens for the operator. The majority of modern swimming pool dehumidification systems use air-to-air heat pumps. These have a refrigeration circuit including a compressor, evaporator and condenser. In this process, warm and humid air is sucked from the indoor pool and passed through the refrigeration circuit’s evaporator, where it is cooled below its dew point and the moisture condenses out. The condensation water is discharged via the building’s drainage. 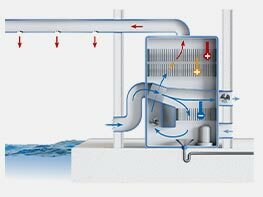 At the refrigeration circuit’s condenser, the air flow is then reheated before being returned to the indoor swimming pool. In addition, the air flow is heated by the waste heat of the compressor. Some units offer an additional supply of external air to dehumidify the indoor swimming pool. Various features are also offered, such as a PWW heating coil, plate heat exchangers, fully electronic control systems or a pool water condenser in order to use the heat released to heat the pool water. There are basically four different types of swimming pool air dehumidifiers. chest units, rear wall units and ceiling units are particularly recommended for use in the changing rooms and wet areas of fitness centres, as they don’t take up much space and are easy to install. 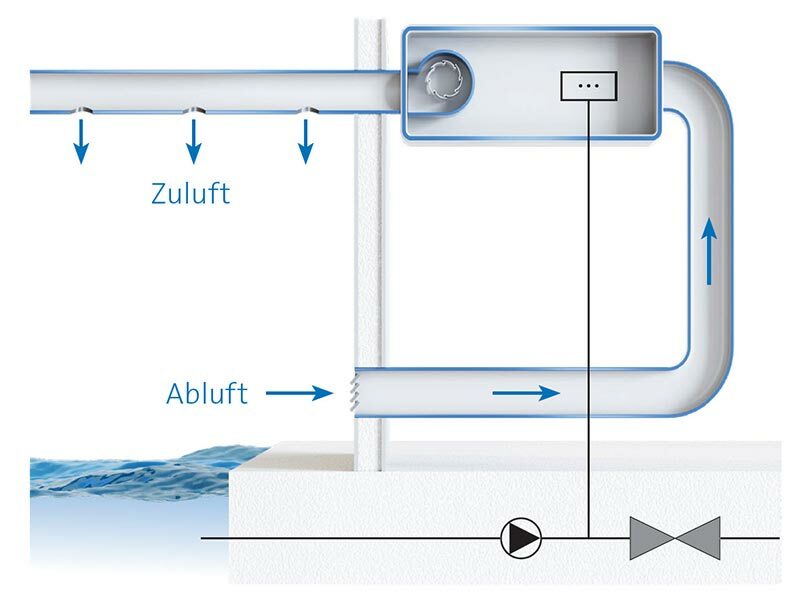 Owing to their simple installation directly in the indoor swimming pool, requiring only wall mounting, an electrical connection and a condensate discharge, chest units represent the most uncomplicated way of dehumidifying an indoor swimming pool. In Fig. 1, how chest units work becomes clear. The humid and warm indoor swimming pool air is sucked in via the bottom or front of the unit, depending on the type, dehumidified inside the unit and then fed back to the pool at the top. Hot water or electric heating coils are available as an option for further heating of the air in the indoor swimming pool as required. VDE 0100-702 requirements must be observed when installing a chest unit in an indoor swimming pool. If the guidelines for minimum distances to the pool edge cannot be adhered to, other dehumidification solutions need to be found. To make optimum use of the air circulation generated by the units, a chest unit should ideally be placed at right angles to the window facade. 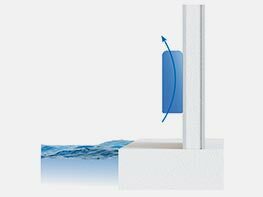 If the swimming pool’s architecture departs from a rectangular layout and is designed in a geometrically sophisticated fashion, several dehumidifying units should be installed to ensure the air circulation needed. 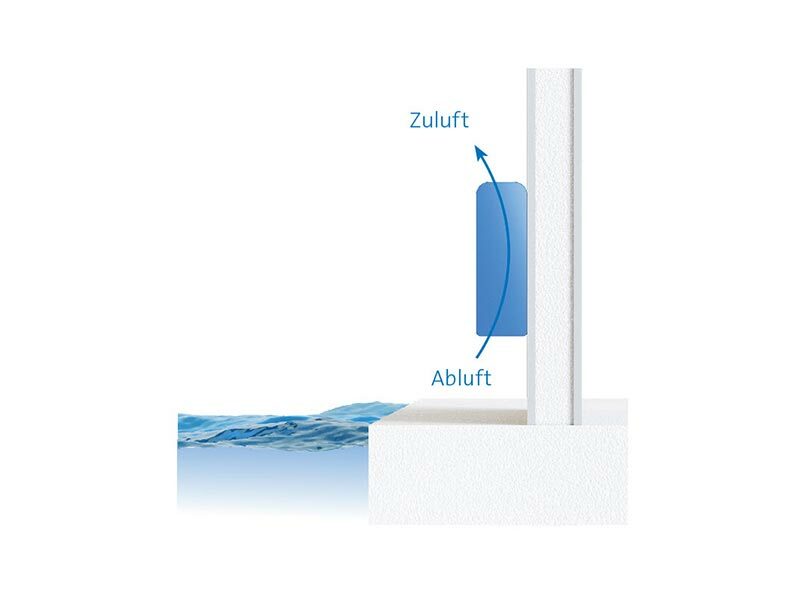 Despite all this, condensation on window surfaces can still occur because fully defined ducting of the air flow is not possible with chest units. Thus in some circumstances additional floor convectors should be installed in front of the window surfaces. Compared to chest models, rear wall units represent a somewhat more comfortable solution, since all of the sound-emitting components such as compressors or fans are located outside of the swimming pool (Fig. 2). Nevertheless, installation in an adjoining room to the indoor swimming pool is easy to carry out. 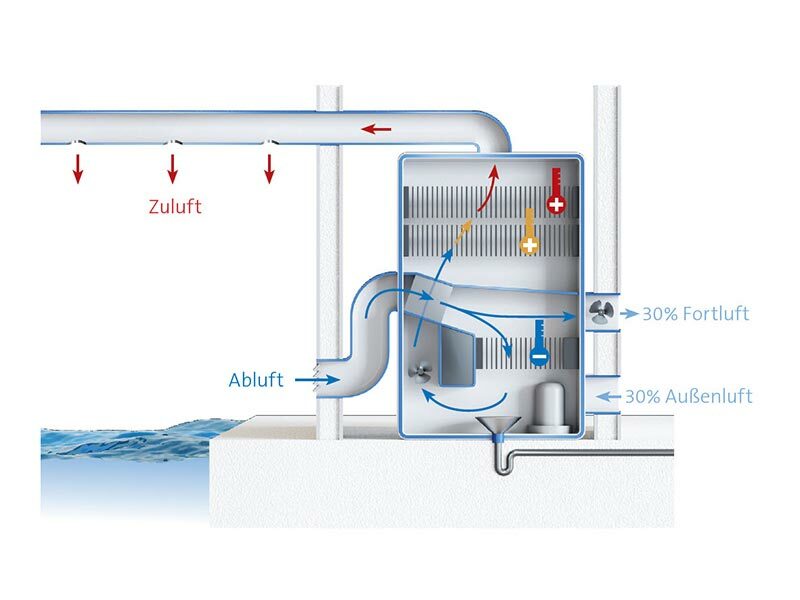 The dehumidifier is connected to the indoor swimming pool via two ducts through the wall, so that only the discreet supply and exhaust air grilles can be seen inside the swimming pool. Thus the swimming pool’s architectural image isn’t disturbed and the operational sound input is minimised. Air dehumidifiers for ceiling installation represent a particularly compact solution for dehumidifying air. Due to their flat construction, they are suitable for installation under the ceiling or in a suspended ceiling. This type of installation is particularly suitable if there isn’t a plant room available or if the existing plant room is too small for the installation of a floor-mounted unit. 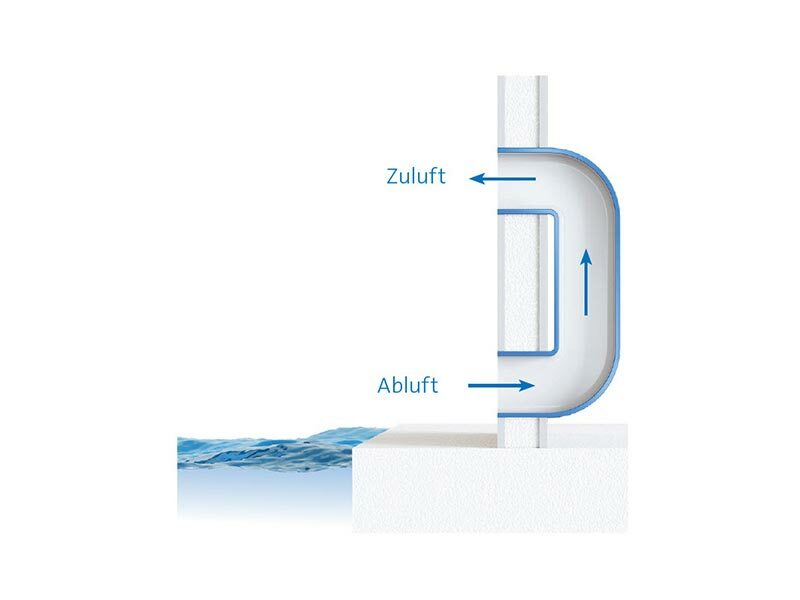 The supply of dehumidified supply air for, as well as the extraction of the humid exhaust air out of, the swimming pool or the area to be dried is carried out on site via ventilation ducts (Fig. 3). Maximum comfort and performance is achieved by installing an air dehumidification system in the plant room. On the one hand, the technology cannot be seen inside the indoor swimming pool and on the other, the air flows are ducted in the best possible way and almost noiselessly through optimum design of the ventilation ducts, air outlets and slot rails. With large window areas, care should be taken to ensure that the supply air is introduced in the lower area and the moist air is extracted in the upper area. In the past, these units were mostly to be found in the public pool sector. However, they’ve now also become affordable for the private sector. This is because the usually higher investment for the purchase and installation of plant room equipment is quickly evened out by the increased comfort and energy efficiency through heat recovery. Due to the large selection, which ranges from simple recirculation air duct units to specially configured ventilation units, every operator requirement can be met in a customised way. Ventilation units for swimming pools, such as in the hotel, sports or wellness sectors, often use a combination of a heat pump and a cross-flow or plate heat exchanger. In many units, as shown in Fig. 4, the hot and humid swimming pool air is sucked out of the swimming pool by a fan and conducted via a cross-flow heat exchanger. The moisture contained in the air is condensed out at the refrigeration circuit’s evaporator and the condensate is discharged via the drain. A part of the air flow is then conducted outside via a fan. The remaining air flow is mixed with a proportion of external air and then conducted to the other air side via the cross-flow heat exchanger. There the mixed air flow is preheated by the warm air from the swimming pool. 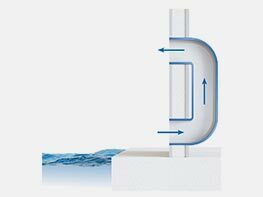 If necessary, further heating takes place via a downstream hot water heating coil. Fig. 4 illustrates in a simplified fashion the way such a type of unit works. These days, the operator of a private swimming pool, wellness or fitness area has wide-ranging options available for the energy-efficient and economical dehumidification of his facility. Already engaging an expert early in the planning phase with regard to the selection and evaluation of an optimal system and to determine possible energy savings is always advisable. Thus, already from the outset, annoyance and disappointment in later operations are able to be avoided.